The Paramount. The address is 724 Pine Street, Seattle 98101. We found it pretty easliy last time, I think there's a Pine St exit off I-5. I think we Mapquest-ed it & it was EZ. I am indulging in melancholy, nursing sweet bites of pain from it like a sore tooth. A yard crew guy gave me a gardenia while I was out talking to the folks in the designated smoking area. How do we become friends, only to hurt each other so much later? 190 ft. at Palisades on 3-27-05. 50 ft. at Snail Shell Cave entrance sink on 9-10-06. Tellico, below Turkey Creek, 1st swim of the year, level 2.9 on the gauge. Flipped in a crease. May 13th, Coosa, 10,500 cfs, at Little Gap rapid. Hey it doesn't count if I was playing, right? July 23rd, Hiwassee, Three Chutes Rapid. What a nice swim. Sun was out, water was cool. Ahhh. Jan 1st 2006 - Chili Run on Cartecay River. Level 1.7/@380 cfs. href="http://www.necky.com/chronic.htm">Necky Chronic. Jan 8th 2006 - Magic City Screwdriver Cave. Jan 14th 2006 - Mulberry Fork, level 1.5 on the bridge. Pics HERE. Necky Chronic. Jan 15th 2006 - Howard's Waterfall Cave. Also Geocaching on Lookout Mtn. Pics HERE. Jan 21st 2006 - Tellico River, Turkey Creek put-in, level 2.9 on the gauge. Pics and Trip Report. Prijon Embudo. Jan 28th 2006 - Mulberry Fork, level 1.5 on the bridge. Pics HERE. Necky Chronic. Also Geocaching around Mulberry Fork and towards Cullman. Jan 29th 2006 - Locust Fork, level 3.2 and rising. Pics HERE. Trip Reports HERE and HERE. Prijon Embudo. Feb 4th 2006 - Locust Fork at King's Bend, Locust Fork Invitational Kayak Races. My 40th Birthday run! Level approx. 2.8 on the internet gauge. Pics HERE. More Pics HERE, of me racing. Prijon Embudo. Feb 5th 2006 - Geocaching at Ruffner Mtn. State Park with Scott Fee and Scott Parvin. Pics HERE. Feb 11th 2006 - Geocaching in Scottsboro, Guntersville, Blountsville, and Cleveland, Al. Feb 12 2006 - Geocaching in Trussville, Pelham, Homewood, and Southside. Feb 25th 2006 - Ridgewalking (searching for unknown caves) near lake Guntersville. Didn't find any but it was a nice hike. Found a weird hole in some sandstone, pics here and here. 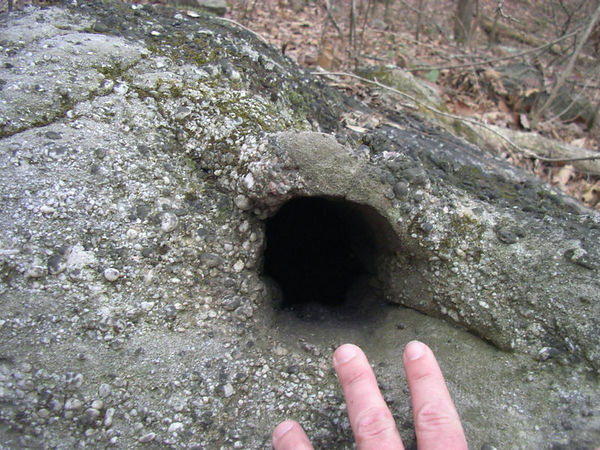 It's a cave for a chipmunk! Feb 26th 2006 - Geocaching in Guntersville state park, around lake Guntersville, and a quick stop at the Summit mall for a cache. Pics HERE. March 4th 2006 - Mulberry Fork, Garden City put-in, level @ 1 ft. on the bridge gauge. March 5th 2006 - Mulberry Fork Race, level @ 1/2 ft. on the bridge gauge. March 18th 2006 - Tellico Ledges section, level 1.15 on the online gauge. March 19th 2006 - Geocaching near the Ocoee. March 25th 2006 - Geocaching near the Locust Fork. March 26th 2006 - Vertical Training Session at Palisades Park in Oneonta, Al. Pics here. April 1st 2006 - Coosa River, 8000 cfs, for the 30th Anniversary of Southern Trails (outfitter). Paddled with: Jimmy. Saw Jeremy Adkins and Eric and Dane Jackson throwing down in the playspot river left of the Moccasin Gap island. April 2nd 2006 - Mulberry Fork, level 2ft. and dropping on the bridge. With: Ross, Troy, Joan Steed, Bill. April 9th 2006 - Broglen and Upper Mulberry Fork, level 2.3 ft. Trip report HERE. April 15th 2006 - Coosa River, 8000 cfs, Pics HERE. Trip report HERE. April 21-23rd 2006 - Buffalo River in TN. Pics HERE. Trip report HERE. April 29th 2006 - Roll Practice, Oak Mtn. Lake. May 6th 2006 - Tuckaseegee River in NC. Level - way freakin' low. New river for me. RUSSFEST weekend. Went to look at the Cheoah on Sunday the 7th. Pics HERE. May 13th 2006 - Coosa River, 10,500 cfs. For a clinic held by Wavesport and Jeremy Adkins/Charlie Mix. May 20th-21st - HEFF FEST, Nolichucky River. 1200 cfs? Rafted the Noli Gorge. Trip Report HERE. Pics HERE. May 27th - Raft Ocoee with B'ham folks, May 28th - Attempt to raft Cheoah, May 29th - Kayak Nantahala, level 3.4. Pics HERE. June 2-4th - SERA Cave Carnival, Buck's Pocket State Park. Pics HERE. June 10-11th - Hiwassee with BCC beginner class. July 9th - Coosa, 2000 cfs. July 15th - HCRU Tyrolean Traverse. Pics HERE. July 16th - Oak Mtn. Lake, Roll practice. Tried Mark's HP roll. July 22nd-23rd - Hiwassee with B'ham Canoe Club. Pics HERE. Aug 6-12 - NSS Convention in Bellingham, Wa. Pics HERE. Aug 19th - Roll Practice, Oak Mtn. Lake. Aug 20th - Larry and Kitty's going away party, at a waterpark in Blountsville. Movies HERE. Aug 26th - Day trip to the Hiwassee, 2 generators. Movies HERE. Aug 27th - Roll Practice, Oak Mtn. Lake. 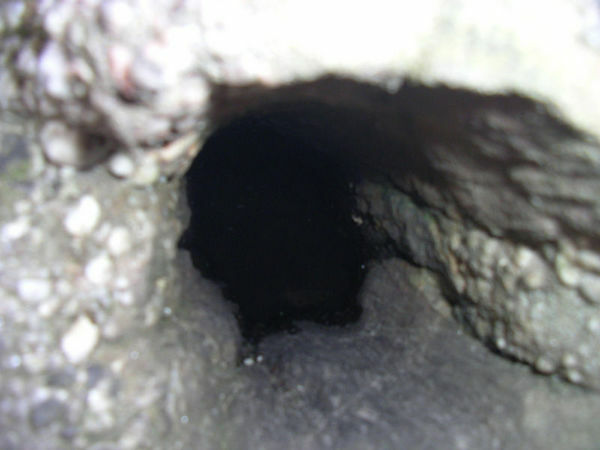 Sept. 9th - 10th -Snail Shell Cave. Pics HERE. TR HERE. Sept. 10th - Geocaching in Central Tenn.
Sept. 16th - Attended Kayak World Cup, Rock Island Tn. Sept. 23rd-24th - Roll Practice, Oak Mtn. Lake. Oct. 1st - Took video at Cheoah. Oct. 6th-8th - TAG Fall Cave-In festival. Pics here. Oct. 8th - Sauta Cave. Pics here. Oct. 14th - 15th - Hiwassee River. New thigh blocks. Oct. 22nd - Locust Fork. Level (corrected) 2.6 on internet gauge. Oct. 26th-29th - GAF at the Nantahala Outdoor Center. Oct. 28th - ran the Nanty falls upright for a change in a Bliss-Stick SCUD. Ron and Jocelyn, newly-weds, paddled their Topoduo. Three friends in Croco-Kayaks. Videos here. Pics here. Nov. 4th - Graves Cave - helped buid the footer for a new cave gate. Pics here. Nov 11th - The Blackwater. A new run for me, class I-II with one II+/III rapid. Near Jasper. Description of run on alabamawhitewater.com under 'Run Index'. Nov 19th - Locust Fork. Level (corrected) 3.0 on internet gauge. Nov. 25th - Ridgewalk and investigation into a pit I discovered awhile back. Pics here. Trip Report here.